The Irish Champion Stakes could see a rematch of the first three home in the Group 1 International Stakes at York last month. On that occasion, Aidan O’Brien’s Declaration Of War got the better of Trading Leather with Al Kazeem back in third. 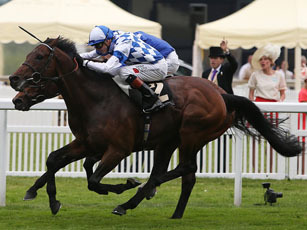 That was a first defeat of the season for Al Kazeem and connections were quick to blame the fast ground for his below-par performance. Declaration Of War has been on the go all season and won the Queen Anne Stakes at Royal Ascot over a mile in June before finishing behind Al Kazeem in the Eclipse Stakes. Trading Leather won the Irish Derby at the Curragh and was second in the King George at Ascot before putting in another brave display at York. Jim Bolger’s colt is again likely to be up with the pace from the outset in an effort to draw the finishing kick from his opponents. John Gosden’s The Fugue won the Yorkshire Oaks in impressive fashion and drops back to a mile and a quarter here. She has a potent turn of foot and will be a major threat if the going does not go against her. Aidan O’Brien has chosen this race to re-introduce Kingsbarns who went into winter quarters as Derby favourite. He has been kept off the track by injury but could surprise the more established stars if fit enough to do himself justice. Jim Bolger, trainer of Trading Leather, also runs Parish Hall who has also been plagued by injury since winning the Dewhurst in his juvenile season. He was well beaten by Camelot in the spring and it would be a big surprise if he were able to win this. Dermot Weld’s Princess Highway beat The Fugue by six lengths at Royal Ascot last season but has not reproduced that effort since whilst 100-1 shot Euphrasia completes the eight-runner field. Bookmakers have found it difficult to establish a clear favourite owing to the changeable going at Leopardstown. Connections of The Fugue were hoping for fast ground at the start of the week but rain on Friday has increased the prospects for Al Kazeem. The Fugue has drifted out from 11-4 to 100-30 whilst Al Kazeem’s price has contracted to 3-1 from 9-4 favourite with Bet365. Declaration of War would also prefer the ground to stay on the fast side and his priced has eased out to 3-1. Kingsbarns is 13-2 and Trading Leather is 7-1 with 25-1 and better available about the remainder.